The All Family Resources Christmas Caroling Kit includes all you need to have a memorable holiday gathering. Find everything from invitations, to caroling safety tips, you'll have the lyrics to print out, the melody to listen to, recipes for holiday cookies, hot cider and appetizers. You'll also find wonderful holiday poems and "How to's" for making those very special holiday gifts. Here are 32 Christmas coloring pages for you to print out, color and enjoy! 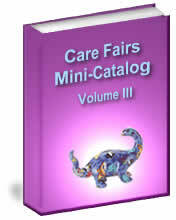 The Care Fairs gift catalog offers you a sampling of gifts for all occasions. Care Fairs is a great place to shop, on or off line, where your purchases can benefit others such as the All Family Resources' Literacy Project.. Both practical and beautiful, their full selection includes over 3000 items for home, office garden, and personal treasures. From a rustic birdhouse to a fine glass sculpture, visitors to Care Fairs can find something to express caring for themselves or others. Learn to relax, so you can enjoy this holiday season with your family and friends. Read about "compatibility" and "how to use" these files on your computer.